We were able to complete every activity on our list for August. I love Autumn so I’m excited to do some fun fall themed activities. 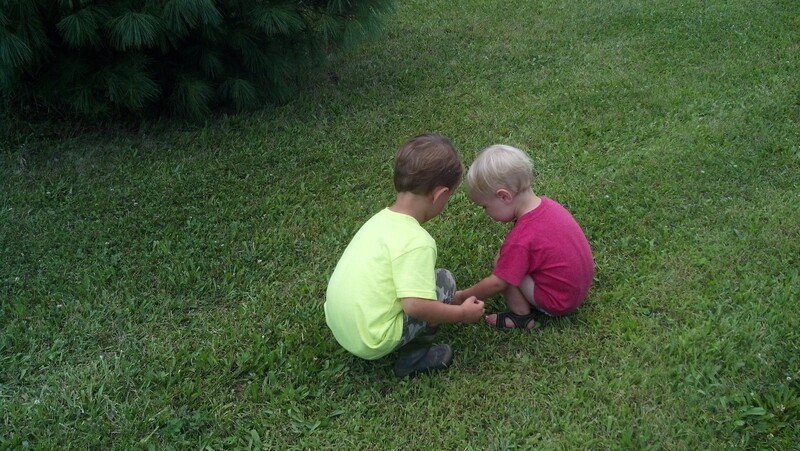 Joe and Jake counting leaves, bugs and sticks. This month we will work on sequencing and numbers. While it is still nice out, we are going to try an activity with dominos and sidewalk chalk. Joe will count the dots on the dominos and match them to numbers I’ll write on the sidewalk. Jake will help by identifying the numbers. We’ll do a fun Letter/number activity with rocks. First we’ll collect rocks. Then we’ll paint the rocks. Then, I’ll write letters in one egg carton and numbers in another and ask the boys to match rock with the egg well. He had a lot of fun cutting out shapes with his safety scissors. I’ll either draw or print out some shapes and pictures and have him continue to practice. Jake is not quite ready for scissors. I’ll probably have Joe cut out a shape and tell Jake what it is. That seems to work well with letters and the magnet game too. We’ll also start adding more chores to his list. He’s gotten really good at feeding Charlie without us telling him to. He just gets up, eats breakfast and then goes to Charlie’s dish. And, he’s great at putting his plate and fork in the sink when he’s done eating. Jake, will work on putting toys and books away. He already does and excellent job getting them out and throwing them all over the place. We’ll work on meal prep this month. Joe has so much fun cracking eggs and helping me make pancakes and other simple meals. Jake enjoys it too. I just have to figure out a way to get them to work together instead of pushing each other. Joe really wants to vacuum. We’ll give it a go, but I’m not sure he’s big enough to push the big vacuum so he might just use the dust buster. …and so on. We’ll see if we can start with “Why did the chicken cross the road” and move on to knock-knock jokes from there. He’s pretty good at singing songs. He’ll randomly break out with “Twinkle, twinkle little star” or “Muffin Man”, sing “Happy birthday to me” and sing about what he is doing. We’ll focus some activities on safety drills: fire, tornado, stranger danger and so on. And, as a fun science-like activity, we’ll finally get to the ice excavation activity I prepared. 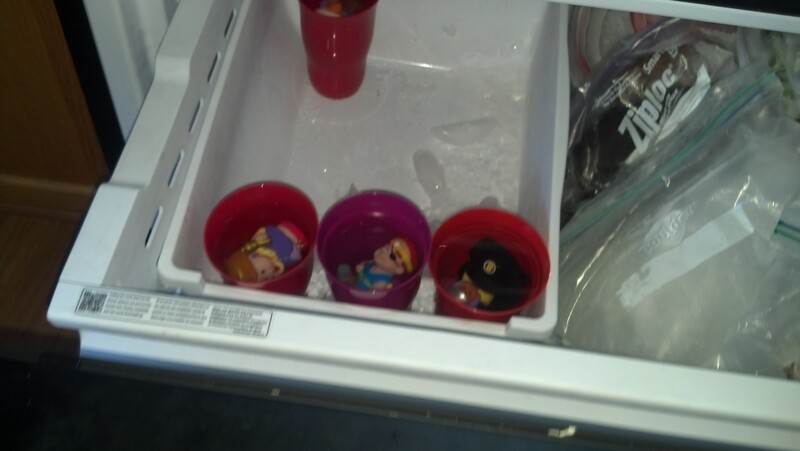 I’ve had these in the freezer for weeks now: ice molds with toys frozen inside. I made one for each of the kids and we’ll try different tools to “excavate” the toys. We’ll take advantage of any other fun opportunity for fun we find…for both learning and fun. This entry was posted in Education, For the Kids, Garden Stories. Bookmark the permalink.